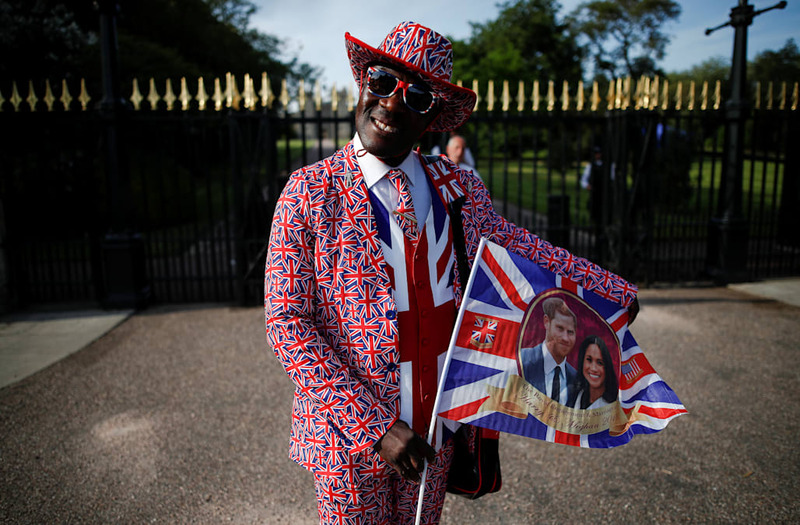 WINDSOR, England, May 18 (Reuters) - They flew in from Ghana, Canada, New Orleans and Essex, dressed in finery to rival the royals they had come to watch get married in the English town of Windsor. Joseph Afrane, from Ghana, poses for a photograph after arriving in Windsor, Britain, May 17, 2018. "I'm here for the big day, to congratulate them. They support the Commonwealth," said Joseph. REUTERS/Damir Sagolj SEARCH "FAN PORTRAITS" FOR THIS STORY. SEARCH "WIDER IMAGE" FOR ALL STORIES. TPX IMAGES OF THE DAY. Kevin Clay, from East Molesey, poses for a photograph after arriving in Windsor, Britain, May 18, 2018. "It's absolutely fantastic that it's happening in Windsor - this is where Elton John got married too. And Meghan Markle is great," said Kevin. REUTERS/Damir Sagolj SEARCH "FAN PORTRAITS" FOR THIS STORY. SEARCH "WIDER IMAGE" FOR ALL STORIES. Trina Moore and her dog Johnny poses for a photograph in Windsor, Britain, May 18, 2018. "My dog came all the way from Italy and I just love Harry and Megan as much as I adored their mother and I wish Harry and Megan all the happiness in the world." REUTERS/Clodagh Kilcoyne SEARCH "FAN PORTRAITS" FOR THIS STORY. SEARCH "WIDER IMAGE" FOR ALL STORIES. Bernadette Christie, from Canada, poses for a portrait in Windsor, Britain, May 18, 2018. "I love the royal family and I am here because this is the best royal wedding in last 30 years," said Bernadette. REUTERS/Marko Djurica SEARCH "FAN PORTRAITS" FOR THIS STORY. SEARCH "WIDER IMAGE" FOR ALL STORIES. June Noel-Parke poses for a photograph in Windsor, Britain, May 17, 2018. "It's quite an exciting time for England, it's something to cheer the people up as well," June said. "It's history in the making and I'll always remember where I was when it happened. It's also good for the monarchy." REUTERS/Clodagh Kilcoyne SEARCH "FAN PORTRAITS" FOR THIS STORY. SEARCH "WIDER IMAGE" FOR ALL STORIES. Adinas Perkins, from New Orleans, poses for a photograph carrying special wedding shoes in Windsor, Britain, May 18, 2018. "I fell in love with the royal family when as a kid I saw Prince Charles' and Princess Diana's wedding. I was here for Williams' wedding and I don't want to miss this one," said Adinas. REUTERS/Marko Djurica SEARCH "FAN PORTRAITS" FOR THIS STORY. SEARCH "WIDER IMAGE" FOR ALL STORIES. Caroline Wagstaff, from Windsor, poses for a photograph in Windsor, Britain, May 17, 2018. "I am here because I am from Windsor," said Caroline. REUTERS/Marko Djurica SEARCH "FAN PORTRAITS" FOR THIS STORY. SEARCH "WIDER IMAGE" FOR ALL STORIES. Sally Rose, from Essex, poses for a photograph after arriving in Windsor, Britain, May 18, 2018. "It's not my first wedding - I came for Kate and William. But we all love Harry. We will stay here overnight - we have drinks and blankets and there will be no sleeping," said Sally. REUTERS/Damir Sagolj SEARCH "FAN PORTRAITS" FOR THIS STORY. SEARCH "WIDER IMAGE" FOR ALL STORIES. Katja Parrock, from Windsor, poses for a photograph with her dog Tilly in Windsor, Britain, May 17, 2018. "We have come down to enjoy the celebrations with everybody. It's a good occasion, you only have this once in your lifetime," Katja said. "I do love the royal family, they are good for us." REUTERS/Clodagh Kilcoyne SEARCH "FAN PORTRAITS" FOR THIS STORY. SEARCH "WIDER IMAGE" FOR ALL STORIES.